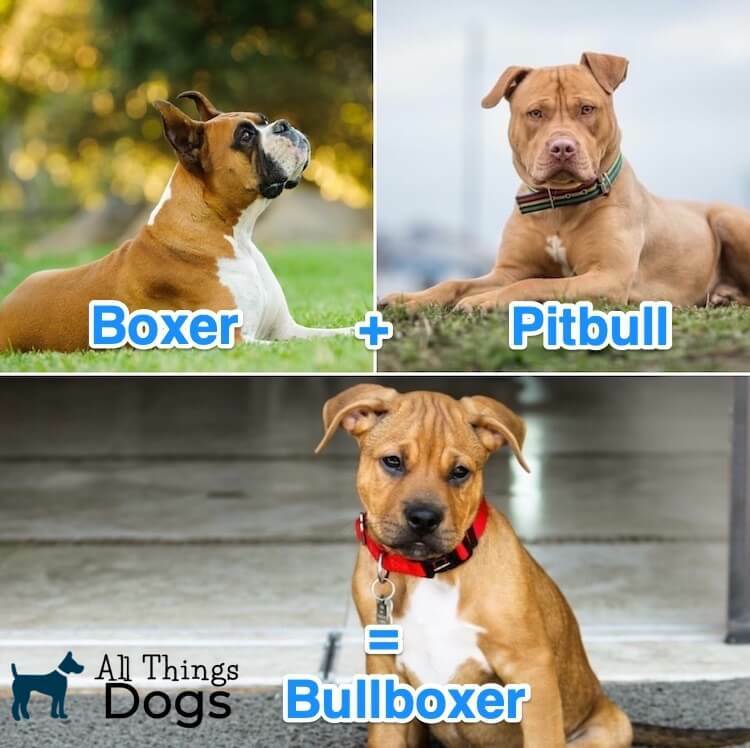 A hybrid of two historic fighting dogs, the Pitbull Boxer Mix is also known as a Bullboxer. The Pitbull was used in blood sports and original Boxers were known as bull biters. However, what we actually get when we cross these intelligent and eager to please dogs, with early training and socialization, is a loyal, playful and energetic family companion. Providing this bouncy mix is legal in your state, the Pitbull Boxer mix is a superb contender if you are looking for a large dog with an even larger personality. Let’s take a look at him in a little more detail and see what it takes to care for him on a daily basis. 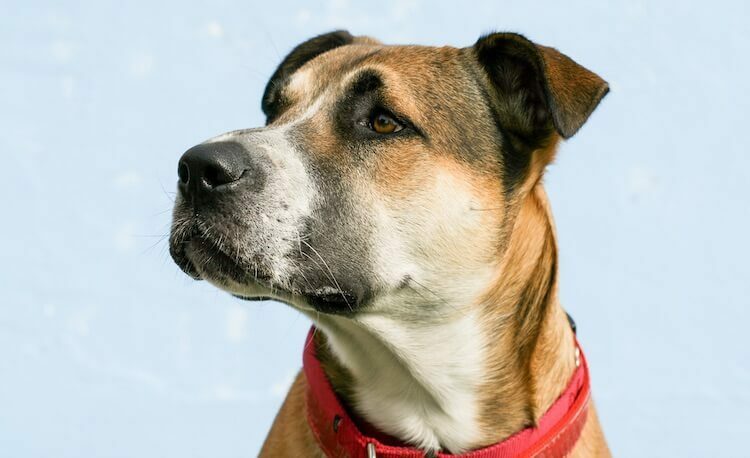 Discover More About This Bouncy Mix: Grab a copy of our free guide to find out more about this mixed breed dog. This dog is a mixed breed with Pitbull and Boxer parents. The Pitbull Boxer Mix is a loyal and energetic family companion. When trained and socialized correctly, they are the most loving comrade you could wish to meet. Being a hybrid dog, you must remember that you could end up with more Pitbull characteristics than Boxer or vice versa. You may notice that Pitbull smile, or you may be bowled over by the Boxer’s paw – where else did you think they got their name from?! It is not clear when the Boxer Pitbull Mix first originated, however, interest in this bouncy mix started gaining momentum around 2009. The Boxer was first registered with the American Kennel Club in 1904, but, their popularity didn’t peak until the 1950s. Pitbull Terriers arrived in the US in the early 20th Century, so it is not surprising that these two impressive breeds were eventually mixed. On that note, let’s look at the parent breeds in a little more detail. More often than not, in this Pitbull Boxer Mix, either it is the Brindle or Red nose American Pitbull Terrier that is the parent. The American Pitbull Terrier stands slightly taller than the other Pitbulls, but, they all have a very similar temperament. Pitbulls originated in Britain. For sport, those barbaric Brits would tie a bear or bull to a post and set a dog to attack. For the dog to succeed, they had to breed stronger, fiercer and more game dogs. 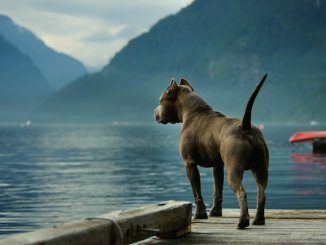 Dog fighting found its way over the water and to this day, Pitbulls are still used in illegal dog fighting rings here in the US. What people lose sight of, is the Pitbull’s unwavering loyalty, eagerness to please and intelligence. Whatever you ask this dog to do, he will do – that is why they are so popular in the wrong hands. In the right hands, a Pitty is the most happy-go-lucky dog, they excel in obedience and activities like agility and are perfect family dogs. The Boxer Dog (pictured above) is one half of the Boxer Pitbull Mix. Equally intelligent, the Boxer just has a little more energy and bounce. Maybe that’s being polite… if you have never been knocked down by a boxer, you have never truly been owned by one! Originating also as a fighting dog, they were used by the Germans to chase and hold down bear, bison and wild boar. Over the years, the Boxer size diminished which made it more suited to family life. 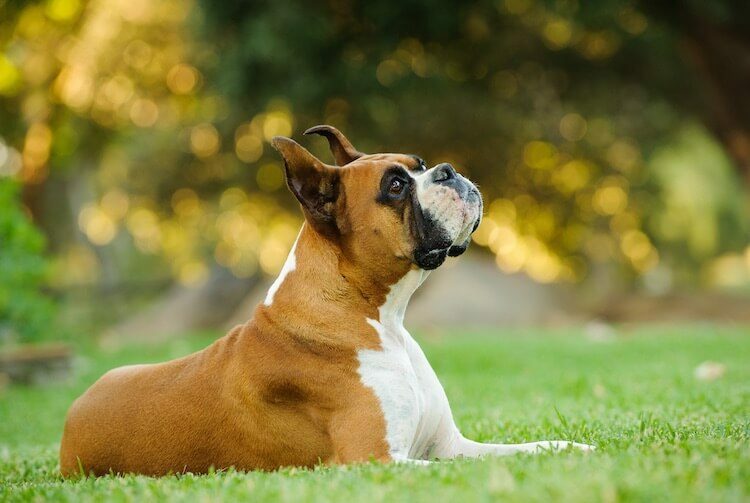 The Boxer name comes from how it spars – they use their front paws to defend or fight. Watch them play with other dogs – they will use those front paws. Being in the American Kennel Club’s top 10 for popularity, it is possible to see why they have had such great success as working dogs as well as pets. 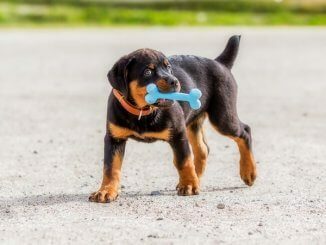 When we combine these impressive breeds, we end up with an intelligent, energetic and playful puppy – a great personality for an active family with experience of large breeds. Thanks to the boisterous Boxer – these Pitbull Boxer Mix puppies can lose focus quite easily. You need to be on your game when training this guy (but don’t let that put you off). If you are looking for a puppy, you can expect to pay anywhere between $500 – $1000 USD and this will vary depending on the breeder. Your Pitbull Boxer Mix puppy will be fully grown between 12-18 months old. Their size will also depend on which Pitbull type the parent is, if it’s not an American Pitbull Terrier (APT). Remember we mentioned the APT is the largest of the Pitty types. When sourced from a reputable breeder, and with early training and socialization, you really do get the best of both worlds with this bouncy Boxer Pitbull Mix. 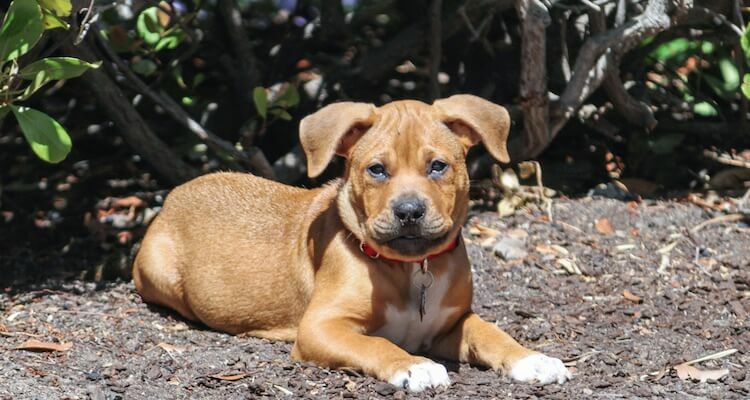 The Pitbull Boxer mix is dependable, bright and wholeheartedly family orientated. He is super energetic, so is best suited to active families who spend a lot of time outdoors. Not only this, but he can get bored quite easily, so mental stimulation is a must too. For that reason, they aren’t suitable for families who are going to leave them for periods of time on their own. They can suffer with separation anxiety which results in distress and destruction. If you do need to leave them for longer than three hours, to keep them calm and occupied, source a local doggy walker. When socialized from an early age, the Boxer Pitbull Mix makes friends with everyone: other dogs, people, even other pets in the home. They are a devoted friend to kids of all ages. Just be mindful with those smaller bodies – their size and energy mean its relatively easy to knock people over. 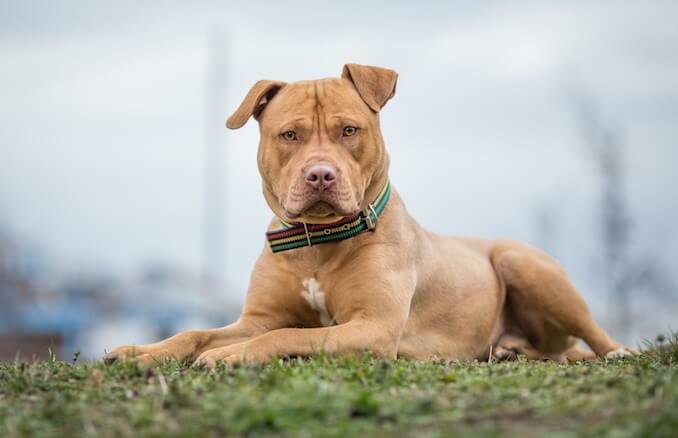 Like other Pitbull guarding mixes, this breed can be protective, so they are often alert and watchful – they will also bark to let you know something is amiss. Other than that, you’ll barely hear a peep from them – that and their house-shattering snoring! Particularly flat faced Boxers are renowned snorers, so if your hybrid has inherited a shorter snout, don’t be alarmed. Best suited to active families, who are super energetic, this mix needs upwards of 60 minutes exercise every day. To get that energy, they eat a lot of food too. Thankfully, their short coat means less grooming time, which frees up your time to train that sometimes-stubborn puppy. As the Boxer and Pitbull mix is a hybrid, you can never be entirely sure how big your puppy will get. Your veterinarian will be able to give you the best prediction as puppies are fed based on their target adult weight, so this information is crucial. The important thing is to monitor his weight as he grows, this will let you know if you are feeding too much or too little. He should have a waistline and from a bird’s eye view, he should have an hour glass figure. You should be able to feel his ribs, but not see them. If you see his ribs, you need to up his daily intake. Being high energy, ensure his food meets his daily nutritional requirements. At least 18% of his adult diet should be protein and 5% should be fat (this is where he gets his energy from). Sometimes stubborn, you may notice you are feeding a lot of treats during training. Make sure you consider how these fit into his daily allowance, consider using low calorie treats as an alternative (if he’s putting on weight) or just hand-feeding and stop bowl-feeding. 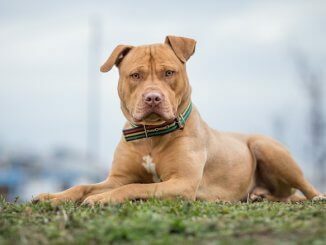 The Pitbull Boxer Mix is super-energetic, and pretty high on the exercise requirements, for that reason, they thrive in busy and active homes. Ideally, they should be getting between 60-120 minutes of exercise every day. 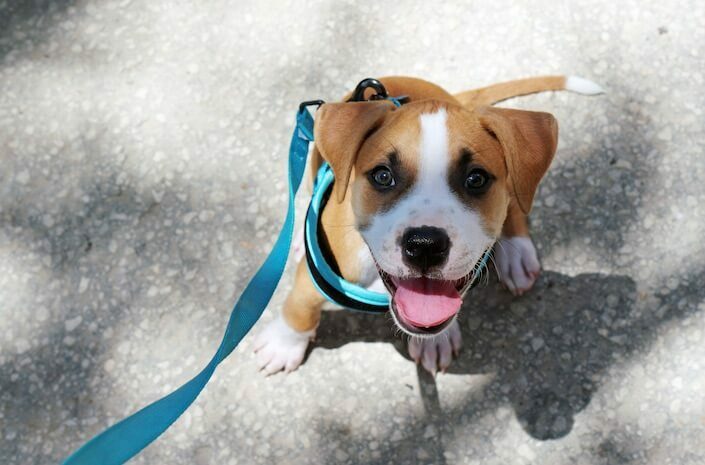 Whilst out exercising your dog, it’s probably best to keep them on leash, firstly, there are restrictions relating to Pitbulls in many states requiring them to be kept on leash, and secondly, their love of everyone means they will run to everyone – not everyone wants a bouncy ball of muscle careering towards them. They are happy in the dog park, walking around the city or hiking in the mountains. You would struggle to find a more adaptable dog. Their intelligence and eagerness to please lends them to activities like agility and flyball – but again, check restrictions. Some classes or clubs don’t allow Pitbulls to participate. As we’ve mentioned, a Pitbull Boxer Mix puppy can be stubborn, so they are best suited to experienced handlers who have a firm grip on training and socialization. Your dog will respond best to positive reinforcement and reward-based training. Avoid the use of punishment. Simply put, it just doesn’t work. It is more likely to create problematic behaviors or exacerbate existing ones. When he’s behaving how you would like him to, praise and reward him – encourage this positive behavior. Dogs learn through operant conditioning – that is, they learn based on the response to their behavior. They are more likely to repeat a behavior with a positive consequence and less likely to repeat a behavior with a negative consequence (i.e. ignoring). Rather than punish a dog, you should re-direct their behaviour. He’s picked up your slipper and ran into the garden with it – find something he wants more, a toy for example and swap. Hip dysplasia – abnormal development in the hip joint causing pain and lameness. Allergies – from food to pollen allergies, this can result in scratching and subsequent skin infections. Thyroid issues – common in Boxers, the thyroid can over-produce or underproduce hormones. Aortic stenosis – a congenital heart defect found in large breeds. Cardiomyopathy – an enlarged heart with poor function. Degenerative myelopathy – a progressive disease of the spinal cord. As both parents have short, smooth coats, you can be relatively sure that this is what your Pitbull Boxer Mix will end up with. The bonus here, is that a smooth coat falls low on grooming maintenance. Brushing 2-3 times a week is ample to keep his coat in tip top condition. 3-4 baths a year will retain the natural oils in his coat but keep him smelling sweet. Pitbull Boxer Mixes come in a range of colors including; black, red, white, grey, brindle, blue, fawn, brown and tan. They are more commonly found in brindle or fawn. They tend to have a longer snout that their Boxer parent, thanks to the elongated muzzle of the Pitbull. For that reason, they don’t tend to suffer with the typical brachychephalic health issues. Their size ranges drastically, they have been as small as 17″ in height or as tall as 25″ and weighing anywhere between 30-80 pounds – as we’ve mentioned, their parents will be the best predictor of size and appearance. The Pitbull Boxer Mix is a smart and dependable companion. High in energy, they are best suited to active homes. When trained and socialized correctly, they will adapt to any family dynamic; being brilliant with kids of all ages. Their boisterous nature can knock small bodies over, so be mindful of this and spend some time on some specific training to nip it in the bud. Check the legal status in your area and whether Pitbulls are banned or restricted. If you are lucky enough to fall outside of any breed specific legislation, the Boxer Pitbull Mix is a playful, bouncy and loyal companion. In summary, a great family addition who is wholeheartedly devoted. Let us know your comments below!